The Air Force's budget would rise to $165 billion in fiscal year 2020 under the White House spending plan unveiled March 12, a $10 billion increase that allows the service to grow, modernize and effectively adapt to an array of changing global threats. One of the more significant additions to this year's budget is a $14 billion investment in the Air Force's space portfolio, a 17 percent increase over the previous year. This investment includes $72.4 million to establish the headquarters for Space Force, which will be a new service within the Department of the Air Force. The budget allows the Air Force to continue its dominance in space while also providing funding to train 1,480 new pilots, an increase from 1,211 trained this year. Overlaying all of it is funding to continue the progress on improving readiness across the Air Force's 690,000 total force. Related is a 3.1 percent pay raise for servicemembers as part of the larger Department of Defense budget. Taken as a whole, the proposed budget for fiscal year 2020, which begins Oct. 1, continues Air Force efforts to add equipment and personnel, training and support to offset an era of lean budgets. 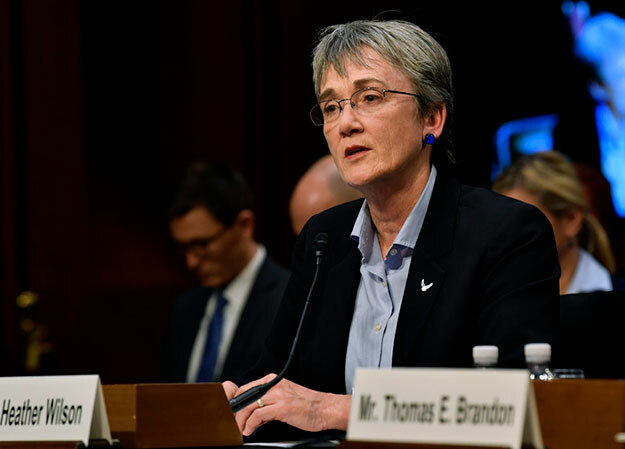 As Air Force Secretary Heather Wilson has said, the new budget is crafted to align the Air Force closer to the National Defense Strategy. Additionally, the budget proposal includes funds for training and for modernizing live and virtual ranges and infrastructure that provide realistic -- and crucial -- training capabilities against the most advanced threats. The Nevada Test and Training Range, the Joint Pacific Alaska Range Complex, the Utah Test and Training Range, the Space Test and Training Range and several smaller range complexes will receive targeted funding to better replicate the capabilities of peer adversaries. While the Air Force budget proposal is carefully crafted and is a proxy for the service's priorities, the document represents an early, and uncertain, starting point of a months-long process. Congress retains the ultimate authorities on how tax dollars are spent with deliberation expected to stretch until the current fiscal year ends Sept. 30 and possibly beyond.